Speech from the Inaugural ESPYs in 1993. The V Foundation for Cancer Research was founded in 1993 by ESPN and the late Jim Valvano, legendary North Carolina State basketball coach and ESPN commentator. Since 1993, The Foundation has raised more than $100 million to fund cancer research grants nationwide. It awards 100 percent of all direct cash donations and net proceeds of events directly to cancer research and related programs. Administrative and fundraising expenses are paid by the Foundation's endowment. The Foundation awards grants through a competitive awards process strictly supervised by a scientific advisory board. For more information on The V Foundation or to make a donation, please visit www.jimmyv.org or call 1-800-4JimmyV. The Jimmy V Perseverance Award was named after and inspired by the late Jimmy Valvano who became the award's raison d'être at the 1993 ESPYS. 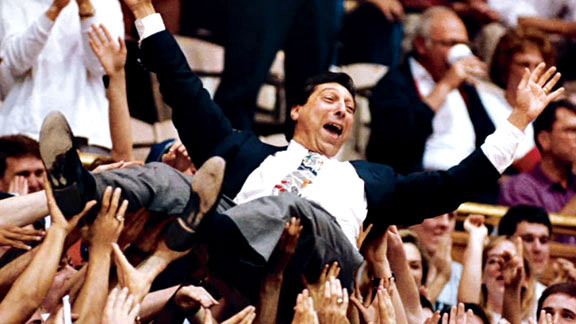 While battling cancer, Jim Valvano gave an emotional acceptance speech which included his famous words "Don't Give Up . . . Don't Ever Give Up!"®. This was Jimmy V's advice to anyone anywhere facing adversity. Valvano passed away less than 2 months later, but his words were never forgotten. The Jimmy V Award is given to a deserving member of the sporting world who has overcome great obstacles through physical perseverance and determination. In 2007, Women's College basketball coach Kay Yow became the very first recipient of the Jimmy V award. In the first game of the 2007 Buffalo Bills season, tight end Kevin Everett laid face down on the field. Don Meyer had his world changed in a head-on collision but refused to let it change his life. Denver Nuggets head coach George Karl is fighting his second bout with cancer. Former Arizona State and NCAA Wrestling Champion Anthony Robles was born without a right leg. Eric LeGrand suffered a spinal cord injury in a game against Army in 2010. Even before he was diagnosed with cancer, ESPN anchor Stuart Scott helped battle the disease. Young Leah Still has touched many through her fight with cancer.